Many centuries ago in North Africa there was a strong Christian movement and presence throughout the region. Today Islam rules and in some nations Islamic governments have instituted laws that make preaching and converting men to Christ a criminal offense. What happened? How could nations and regions that were once Christianized become such strongholds of Islam? History tells us the story. In North Africa when Christian theologians began to have doctrinal disagreements the emphasis on the great commission was diminished, and then the devil gradually moved in. “Go into all the world and preach the gospel to every creature…he who believes and is baptized shall be saved…and these signs shall follow those who believe” (Mk 16:15). These final words of Jesus are so powerful, and yet so easy to neglect and lose sight of. Simply put, the Church is commanded to evangelize with signs following, or reap the consequences. The consequences in North Africa for not keeping the great commission, as the Church’s central focus, were death to the move of God and Christianity. Think of the many generations that have been affected by the Church’s neglect in North Africa. The same I’m sure could be said of many other nations. Europe is another continent that was entrusted with the gospel in the early centuries and at one time had many strong churches that dotted its landscape. Yet today, a good number of the European nations are like sewers infested with atheism, humanism, and false religion. Neglecting to focus on the fulfillment of the great commission with power allowed darkness to move in. The same could be said of local churches everywhere: Lutheran churches; Methodist churches; Presbyterian churches; Pentecostal churches; Charismatic churches. In their earliest beginnings many of these churches experienced revival and were zealous in evangelistic work. Many have since grown cold and complacent and some have died. Several years ago a friend of mine ministered in a church with approximately 60-70 people. The Spirit of God gave him three words to preach on. “Evangelize or die!” Some people were angry and offended at this word. The church, however, soon got past being offended and entered into obedience. In a very short time this church grew to 700 people. “Evangelize or die” is an in season word for many churches today. Just imagine what would happen to the body of Christ worldwide, but especially here in America, if this word was taken seriously. Here is what I’ve observed in local churches: Man-hours, energy, focus, money, time, and resources are put into different areas of the church, but evangelistic work is sorely neglected. Oh yes, we have our outreach programs, but many of these are service or socially oriented works only. The zeal of God and the real soul-winning spirit can sometimes be lacking. We need fresh fire! We need a touch of wholesome fanaticism! 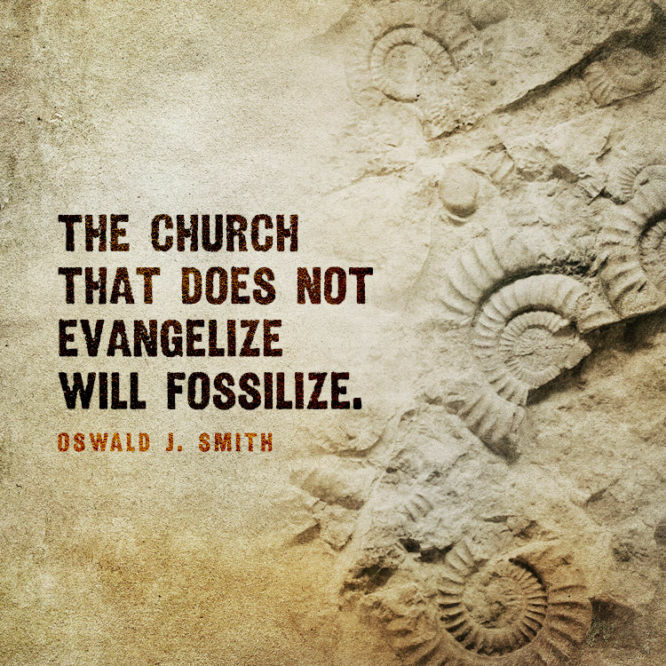 Evangelism is the purpose, and we need to keep the purpose at the forefront. Service is good, but service with evangelism is far better. The purpose is to get people saved by preaching the gospel with signs following (Mk 16). We are commanded to do good works and service-oriented programs are certainly a part of that (Mt. 25:31-46), but in and of itself, these programs cannot save anyone. Without question, we must continue to teach and educate people with truth and demonstrate the love of God, especially through acts of service and kindness, but without a certain kind of zeal and a preaching with power, the kingdom of God makes very little penetration into the world. The Salvation Army organization is an example of what has happened in many Christian churches and institutions when service and social programs are placed above the fervent preaching of the gospel. Many of our Salvation Army centers today are social organizations only, with little or no fire (how many times has a Salvation Army worker shared Christ with you especially during holidays like Christmas when donations are received outside department stores and supermarkets?). What a word of wisdom! How accurate and fitting is this utterance for the present hour generation! Even his own organization has for the most part fallen prey to this amazing prophecy. We must realize that God has chosen the foolishness of preaching to save those who believe (1 Cor 1:17-18, 21). Do we really understand that without preaching people cannot be saved? The early apostles serve as our timeless examples that public preaching is necessary to the growth of the Church. But the task of preaching the gospel wasn’t committed only to the apostles. Everyone preached the gospel in the early Church. “Therefore they that were scattered abroad went everywhere preaching the word ” (Acts 8:4). “Now they which were scattered abroad upon the persecution that arose about Stephen traveled as far as Phenice, and Cyprus, and Antioch, preaching the word…And some of them were men of Cyprus and Cyrene, which, when they were come to Antioch, spake unto the Grecians, preaching the Lord Jesus” (Acts 11:19-20). Now think about this: The early Church preached the gospel during times of great persecution. How much easier it is to preach during times of relative peace? When the Church fails to preach the gospel during times of peace, evil advances. The devil is merciless. Haven’t we seen this in America where courts are assuming more power than any branch of our federal government and seeking to uphold laws that would limit the preaching of the gospel? Even now it is happening! This is not the time to back down. This is the time for the Church to step up her efforts in prayer and the public preaching of the gospel with signs following. This is an excerpt from our book, The Real Spirit Of Revival. Amen, brother! There was a time my wife and I were indifferent about evangelism, until the Lord through a series of events, revealed the reality of hell to us and the plight of the sinner. My Bible says that Jesus was moved with compassion, these days we go onto the streets to witness, not because we want the church numbers to increase, but to introduce Jesus Christ to a lost and dying world that is heading in the wrong direction. We meet a lot of Christians that want to evangelise but don’t know how. The Lord, at times, uses us to teach and train others how to effectively witness and pray for the sick in the streets. So I’d be a hypocrite if I were to say I always had a heart for the lost, the Lord has to convict people of the need and this has to come from the pulpit. It’s all a part of equipping the saints for the work of the ministry, isn’t it? It’s easy to become indifferent if we don’t keep ourselves in the love of God (Jude 21). Bless you! Thank You Brother. I was blessed reading this. The Ministry of Reconciliation ought to be our paramount pursuit in life. It ought to be one of the evidence of the new creature life, just as breathing is an evidence of the presence of human life (2Cor.5:17-18). When this is missing, it’s a sign that love has begun to wax cold. Paul said, “the love of Christ constrains us…” (2Cor.5:14). That’s exactly right. Excellent! Thanks for your comments.